Mix together all of the ingredients, except the chicken, in a bowl. Place chicken in slow cooker. Pour orange mixture over chicken. Cook on low for 6-8 hours until done. I served with Jasmine rice and steamed broccoli. Enjoy! 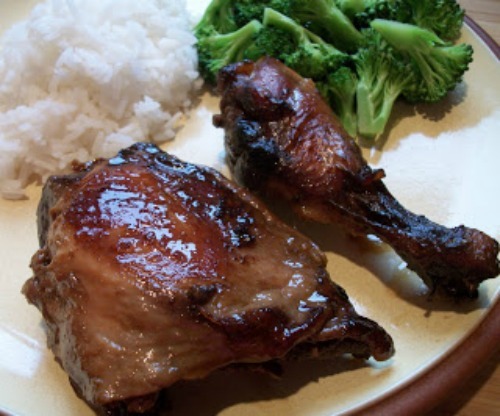 Print recipe for Slow Cooker Asian Orange Chicken Thighs and Drumsticks. Freezer Prep: Place all of the ingredients in a gallon sized freezer bag and store in the freezer. Thaw in refrigerator the night before you plan on putting in the slow cooker. Pour all of the ingredients into slow cooker and follow directions above. This chicken sounds absolutely delicious. I am always looking for new recipes for my crock pot. This sounds sooo good, and easy. I’m bookmarking this to try soon!! This looks delicious! I love my slow cooker. Did you broil these when you took them out of the slow cooker? They look really browned for the crock pot. Katie – I am always looking for crock pot ideas too. Kirstin – I hope you like it. Julie – I did not broil them, but that would be a great idea. I think the ones that I have in the picture were at the top of the crock pot and maybe weren’t cooking in the liquid the whole time, so they browned. Dana – Hope you like it. I know this is an old post, but I found this recipe about a year ago. Since then it is in my regular recipe rotation! A great way to use leftover meat in the freezer. I did this in a pot, ornge juice,frzn chkn and its delicious!